Margaret Gorman from Cong Self-Catering & Boat Hire was in touch to report on good fishing for some of their guests, as well as a landmark catch for one of her youngest. Karl Gorman, aged 6, caught his first fish ever on Sunday and he was so excited. He caught two fish and returned another one. Twin brother Ronan caught some fish too, but this is the first for this year. He caught one fish and returned another one. 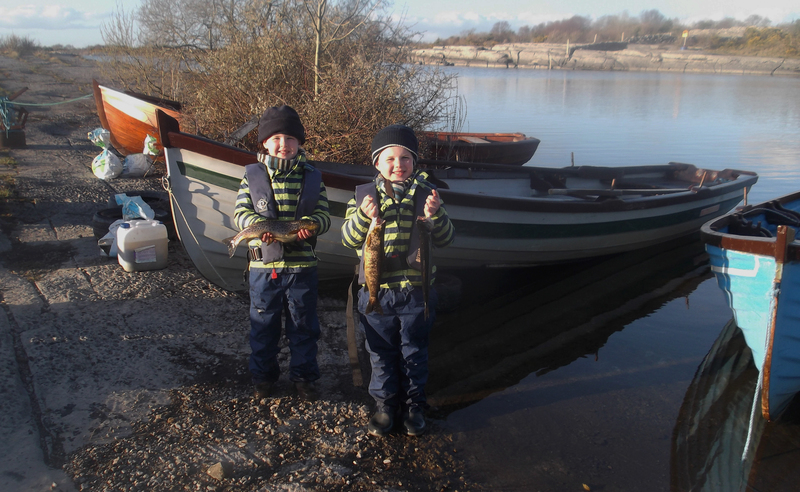 Twin brothers Ronan (on left) and Karl Gorman (6), with their fine catch of trout from Lough Mask on Sunday 12th April. Karl caught his first ever trout, following it up with 2 more, while Ronan caught 2 as well on a great day out. Lough Mask has been fishing well this past week despite difficult conditions. Other guests of Cong Self-Catering who caught fish from Dringeen Bay included Joe Featherston, Dublin, who had 7 trout, all caught in Dringeen Bay. His catch included 2 fish at 3lbs and 2 fish at 2lbs. Jimmy Fleming from Kerry landed 5 trout for his day, while Lee Corrigan from Dublin had 9 trout, all in Dringeen Bay over a couple of days, returning 4 fish. Frank Reilly reports that anglers are reporting seen the occasional olive through the last of the duckfly hatches in the Corr Na Mona area, and around Greenfields and the lower lake. Corrib fished well over the last week with 58 rod days recorded returning 63 trout, despite very bright conditions. The Bartley McGauley Cup was held in Oughterard on Sunday with 35 anglers returning 14 trout. 1st was Willie Molloy with 4 trout for 3.96kgs. 2nd was Seamus Kelly also with 4 trout for 2.88kgs. 3rd was Mike Faherty with 2 trout for 2.0kgs. Also fishing in the Oughterard area were James and Peter Kelly for one day; they landed 3 trout for 7lbs. Joe Quinn and friend from Mullingar fished for 4 days and landed 12 trout for 21lbs to wet fly and buzzer. 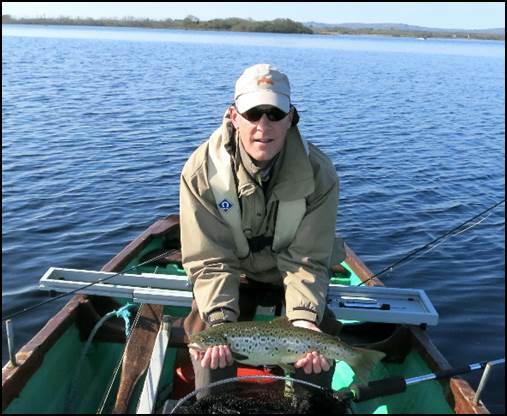 Barry Shaughnessy from Meath fished for 1 day and landed 5 trout on wet fly. Very few anglers were fishing the Corr Na Mona area over the last week, however Peter Curran fished for 2 days and landed 5 trout 8.5lbs on wet fly. Barry Molloy, Cong fished for 2 day also and landed 7 trout. 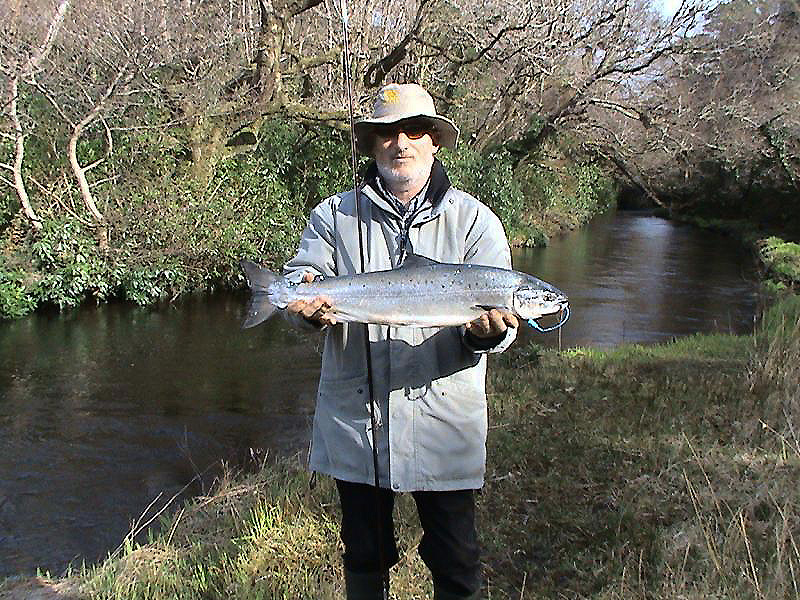 Padraig Walsh, Corr Na Mona fished for 1 day and landed 1 trout to wet fly. The Greenfields area also had very little angling over the last week. Brian McInerney and Pappy Cotter, Ennis fished for one day and landed 7 trout for 11lbs on wet fly. Sean Dixon, Ennis fished for 1 day and landed 1 trout. John Weir and a friend fished for one day and landed 2 trout to wet fly. Brian Hughes from Wales, with a nice 4lbs 2oz Corrib trout taken in bright conditions, April 2015. Jeremy Shanahan with his 8lbs springer from the Kylemore Abbey Fishery on the Dawros River.